The Mormon Lit Blitz is the world’s premier contest for Mormon Micro-Literature. Held annually, the contest has helped expose fickle online readers to engaging Mormon flash fiction, poetry, short essays, and so on for longer than most missions last. 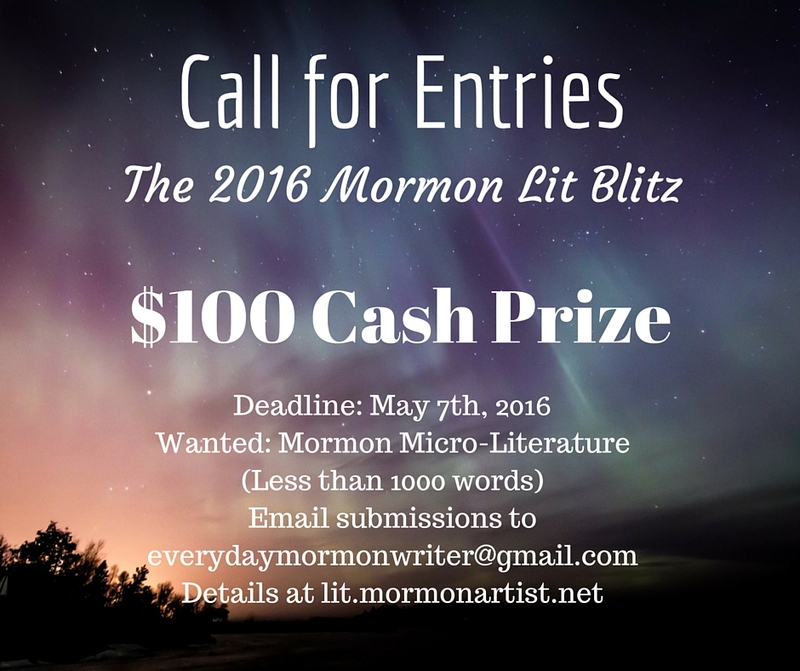 Submissions for The Fifth Annual Mormon Lit Blitz Writing Contest are due by 7 May 2016 to everydaymormonwriter@gmail.com. Submitted works may be in any genre so long as they are under 1,000 words and designed to resonate with an LDS audience in some way. Previously published material and simultaneous submissions are acceptable. Up to three submissions are allowed per entrant. Finalists will be posted on the Mormon Artist magazine website (lit.mormonartist.net) starting in late May. At the conclusion of the Lit Blitz, readers will vote for their favorite pieces and a $100 prize will be given to the winner. For updates about the 2016 contest, follow the Mormon Lit Blitz Facebook page. To facilitate the judging process, we prefer to receive submissions as .doc, .docx, or .pdf attachments with the author’s name and contact information in the body of the email but not included in the attached text. Please email submissions and any questions you may have to everydaymormonwriter@gmail.com. By submitting, authors give us the one-time rights to publish their work electronically. As stated above, previously published work is fine if you still have the rights to the piece and if it meets the above contest requirements. Does the poetry have to be 30 lines, or is that a maximum or minimum? Traditionally, 30 lines has been the maximum. If the poem is slightly longer, we’d still be interested in seeing it. Just an fyi, the links to at least two of the years of finalists are broken. I was sad about it because I was looking forward to going back and reading a couple of my favorites! Are there better links elsewhere? Have those years just disappeared into the ether?